I am a very romantic girl, and always I expresse it in my projects. So I'm in love with the beautiful Sweet Cakes Collection, it is perfect for Valentine's Day projects. Then I created a page, with flowers and bow for the one I love, my best friend, my partner, my hubby!! And another Project is a heart of checkers game. It's very easy to do, and is a cute home decor. Cut out a heart on your favorite cardstock or patterned paper, and then sew the lines of the board. Then, punch two different colors of small hearts, and glue them on the board. Then make a ruffled with a strip of paper, and glue it below the heart. Supply list Project 1: dotted daisies-double-sided cardstock, heart to heart-double-sided cardstock, candy hearths-double-sided cardstock, hugs&kisses-double-sided cardstock, berry sweet-double-sided cardstock, sweet cakes-sugar coated, sweet cakes fancy frills, multicolors i love you-doodles, lilly white-mini jewels, bumblebee-mini jewels, boutique brads-sugar plum assortment, paper frills-limeade. Supply list Project 2: chenille DB cardstock, sweet cakes 6"x6" cardstock paper pad, baby cakes - double-sided cardstock, lilly white-mini jewels. And now for the giveaway, visit my blog at http://www.scrapbyrophilippsen.blogspot.com/ and become a follower and leave a comment and then back here and leave a comment, you are then entered to win the Sweet Cakes line! I have added Philippsen to my reader. Thanks for the chance to win! Just started following your blog, great blog! 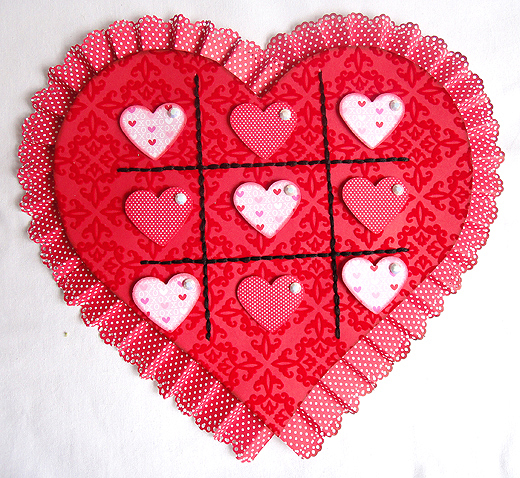 Gorgeous projects, love the page and the checkers game, I love all things Valentine, TFS! I'm a follower of your blog!! Great ideas!! BEautiful layouts! Thanks! Oi... Seguindo aqui tb (crieartezzanato). Já comentei no outro post. I wrote a comment and started following her blog. I hope I did it right...it was in Spanish. LOL! Both projects are darling! The flowers are amazing and I love the altered heart! Beautiful artwork. I've left comments and am now following your blog. I already follow the doodlebug blog! These are fabulous! I am a follower! I am now a follower, thanks for the chance to win! I am now a follower of Philippsen's blog. I will be checking it for inspiration. Thank you for sharing today. Beautiful projects!! I'm a new follower of Philippsen's!! I'm a new follower of Scrap by Ro Philippsen. Especially liked her Valentine Heart Checkerboard. Thanks for giveaway chance. Seguindo, comentando e agora cruzando os dedos. I am a new follower of Ro Philippsen. Loved the checkerboard. I'm a new followe of Ro. Her projects are fabulous and fun. I just visited Nancy's blog and saw the great treat box she made using the Sweet Cakes line...adorable! I became a follower on Ro's blog. I'd love to win the Sweet Cakes line! Fabulous Ro!! Love especially your layout! I'm already a follower on Ro's blog. Thanks for the chance to win! I became a follower of Ro's blog! I love the inspiration there and I really love this line of papers! Thanks so much for the chance to win! Fabulous projects! I also signed to follow your blog! Comentando e seguindo aqui também. Love these projects, so happy and fun! Looove the page and the game!